Last night as I was in front of the laptop the battery died and I caught the reflection of myself in the black screen - with exactly the same face! Baby Bee does the same face!!! It cracks me up every time. Now I am starting to wonder if I walk around looking like that too? I love the funny faces they pull - my daughter's latest one is to stick her tongue out, screw her face up, and go Bleeeurrrgh!! Awww, cute face!! 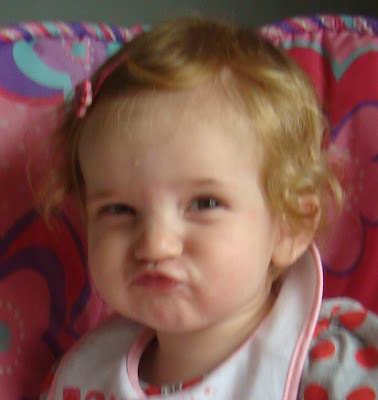 I love my daugter's funny faces!! You can have some fun with this picture when she's older!